A crop of Mark Englert’s latest Star Wars piece. Luke Skywalker, Han Solo, Princess Leia, and Darth Vader are, obviously, the stars of Star Wars. But one important “cast member” that rarely gets mentioned along with those characters is the fastest hunk of junk in the galaxy: the Millennium Falcon. 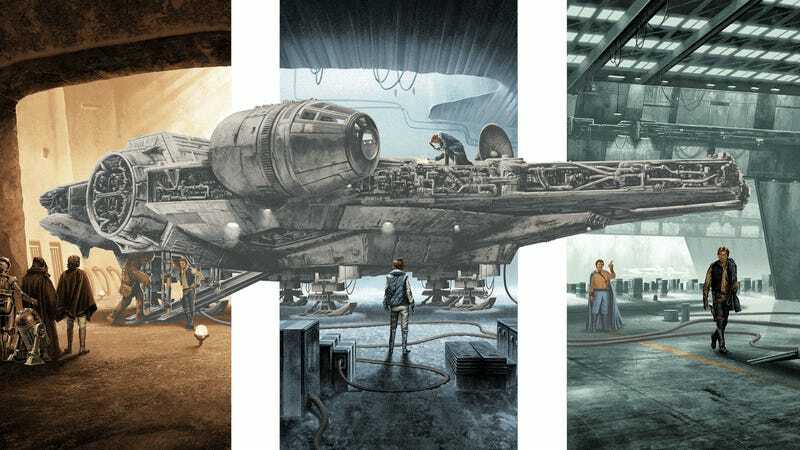 Artist Mark Englert has once again teamed with Bottleneck Gallery and Acme Archives to create a beautiful Star Wars tribute. And while his recent posters were for the current films, this new one goes back to the original trilogy. It takes three scenes in hangers and links them all through the Millennium Falcon. This 36 x 24 inch screenprint, affectionally titled “She’s Got It Where It Counts,” goes on sale noon EST on Thursday, Oct. 4 at bottleneckgallery.com, and will remain on sale through 11:59 p.m. EST on Sunday, Oct. 7. The gallery will print however many are sold. It costs $65. Also, if you are at New York Comic-Con this week, you can get the variant edition of the poster, which is a run of 250 and costs $75. Stay tuned, because we’ll have lots more awesome pop culture art from New York Comic-Con coming later this week.